We're in the thick of it with mail order at the moment, with boxes going out all the time, but don't worry, there's still time for you to get your order in. Why not browse the website and place your order now! After our success at Cardiff, we're heading up north to the Harrogate Spring Flower Show next week, open 25-28 April, we hope to see you there! Click on Shows on the left hand side of the page and you can see where else we'll be exhibiting in 2019. First discovered in the late 17th Century, the genus fuchsia was named after the botanist Leonard Fuchs. As more and more fuchsia species were discovered plant hybridisers soon got to work, the result being the fantastic range and variety available today. Over the years we have honed our range, carefully selecting varieties which provide good consistent results in order to provide the very best to you, our customers. Once again we thank you all for your kind comments and hope that you will find something to suit your particular garden. We aim to have a fuchsia for everyone - be they a complete novice or a hardened fuchsia fanatic. 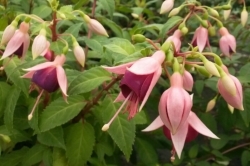 So what are you waiting for - explore the following pages and place your order without delay to ensure your own fabulous fuchsia show and remember all the plants which we sell are propagated and raised on our family run nursery in Suffolk, so you will be supporting British horticulture. This is how our plants are packaged before being sent to you via first-class post. Young plants in 6 cm pots are dispatched from early March to end of May. Orders can be placed at any time in advance; when you can either specify when you would like the plants delivered (please allow up to 30 days from date of order), or if you do not choose a date they will be delivered in April. Orders received during the mail order season will automatically be dispatched as soon as possible unless otherwise specified. The majority of orders tend to be sent within 10-14 days, but we do ask that you allow up to 30 days from receipt of order. Our full catalogue can be viewed here on the website together with online ordering facilities. When making up an order of your own choosing please order in multiples of six plants (made up of any combination of varieties), as this is how the packaging comes. PRICES :- EACH BOX OF 6 plants is £24.90 inclusive of post and packing. Too many to choose from? Why not treat yourself or someone special to one of our great lucky dip boxes and save £6! Each box contains six different labelled varieties. Save £2 on every box of six plants when you order before 31st December each year for next Spring delivery! Our full catalogue is available here online, together with details of how to order. However, if you would still like to receive a copy of our paper catalogue please send in a 1st class stamp together with your name and address. We regret that e-mail only requests will not be responded to due to the immense number and the rising costs are proving very prohibitive.